The World Is a Narrow Bridge. One of the last mysteries of the world is how the New York Times compiles its weekly list of the best-selling books in America. Everyone knows it’s based on a survey of a sampling of small, large and online sellers. But it’s critical to the fairness of “The List”—so named because it’s really the only best-seller list that matters—that the precise sellers and their weightings not become widely known, or else it’d be easy to game the results. In the sadly shrinking world of book publishing, that list is even more important than it used to be. It not only reveals what’s already selling but helps determine what will sell, since both physical stores and online sellers promote those books that make the Times list, creating a cycle of success for the author. When Leadership came out, it shot to No. 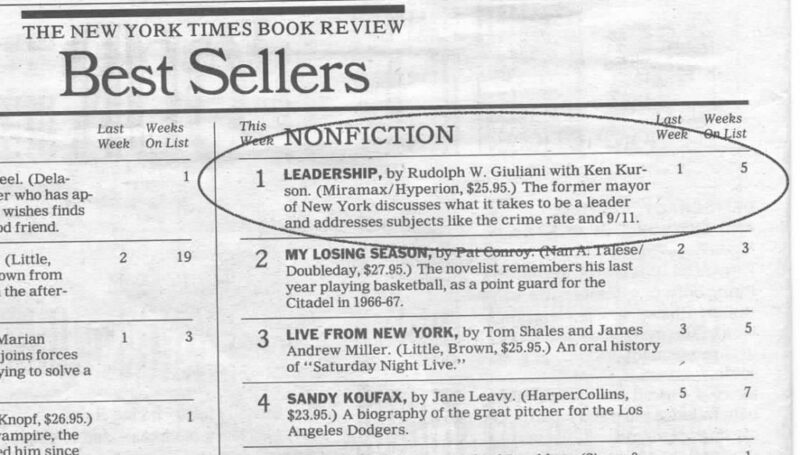 1 on the New York Times list and stayed there. It spent five weeks at No 1 and 26 weeks total on the list of the 15 best-selling nonfiction books in the country. So that was lovely, but it’s not well understood how many weekly sales separates the No. 1 book from the No. 15 book. And the sales of No 10 might easily be just a hundred or so more than No. 15. Back in 2002, the big online sellers were just starting to dominate. Our book made it to No. 1 overall on both Amazon and BarnesAndNoble.com, which was a big deal because usually fiction dominates those lists. This story I wrote for the Observer goes into some of the context of two competing biographies of Roger Ailes. Because one book was positive and the other negative toward the Svengalie of Fox News, it was a good opportunity to float my theory that The List has a subtle bias against right-leaning books. I was never able to really prove the case one way or another but I heard from a bunch of authors who felt that their books had also been victimized by “unfair” compiling of the Times list. There’s no one as aggrieved as an author whose book isn’t selling.